As a library administrator, you can configure custom actions to trigger a specific custom script on a relation. You can trigger Relation Filter or Relation Render Action custom scripts on a relation. Learn more: Create custom scripts. 1. Open the library administration interface and select Relations. 2. Press a relation name to open the relation configuration. 1. 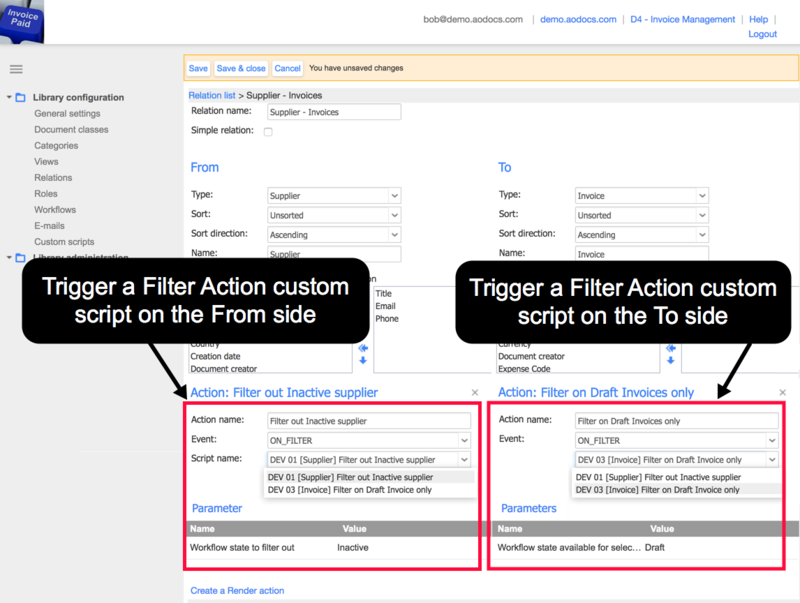 Press Create a From Filter action or a Create a To Filter action to trigger a Relation Filter custom script. - The side of the relation is important when configuring a custom filter action. 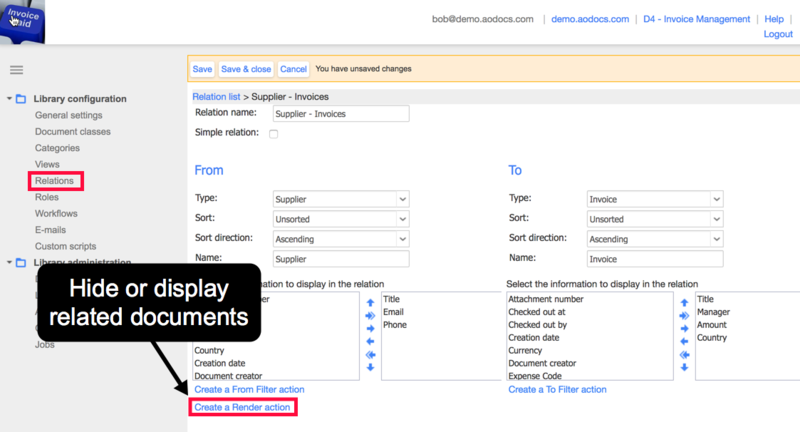 For example, let's say you have configured your relation Supplier – Invoices so that the document class Supplier is on the From side and the document class Invoice is on the To side. 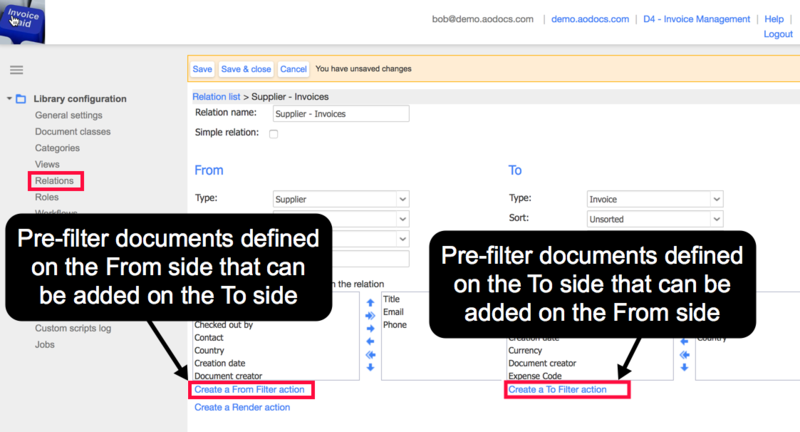 If you create a From Filter action, the custom script will filter the Suppliers you are allowed to add as a related item from an Invoice. - You can trigger only one Relation Filter custom script for each side of the relation. Note: You can select only Relation Filter custom scripts. Learn more: Create custom scripts. 3. Check the Parameters table. 1. 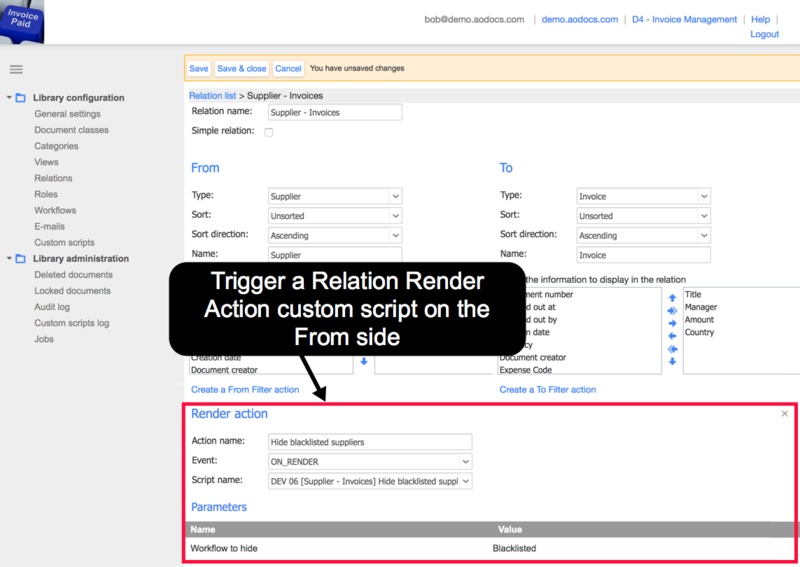 Press Create a Render action to trigger a Relation Render Action custom script. - You can select only Relation Render Action custom scripts. Learn more: Create custom scripts. - The custom action configured doesn't depend on one side of the relation.